This unique dual-bay adapter enclosure gives you an easy and cost-effective way to upgrade legacy systems such as desktop PCs and servers, by letting you install two 2.5" solid-state drives or hard drives into a single 3.5" drive bay. The adapter enclosure lets you install newer, higher performing drives such as SSDs into legacy systems that may only support 3.5" hard drives. The enclosure provides a cost-efficient way for companies and organizations to enhance storage performance and reliability without expensive upgrades to core IT systems. 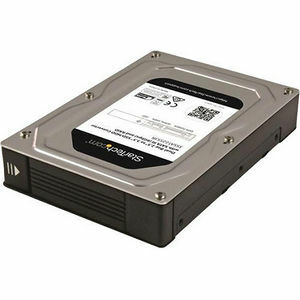 It's also ideal for system administrators and integrators who want to build a system or upgrade a system with limited SATA interfaces to take advantage of the increased drive performance of 2.5" SSDs or increased capacity with support for two drives. The adapter enclosure allows you to install two 2.5" SATA drives into an internal or external 3.5-inch bay, such as a drive drawer caddy or tray, or 3.5" drive enclosure. To utilize the full speed potential of your SATA III hard drives, the drive converter supports SATA III for transfer speeds up to 6Gbps. Suitable for drives with a height of up to 9.5 mm, virtually any 2.5" SATA drive can be made to look and function like a 3.5" drive. The adapter enclosure is equipped with hardware RAID to provide improved performance and data redundancy. The enclosure supports both RAID 0 and RAID 1 as well as Spanning, and JBOD, and lets you choose your preferred backup mode by simply adjusting the RAID setting switch. The RAID 1 functionality is ideal in a hot-swapping server environment, providing a level of security and reliability to your data through data redundancy. With RAID 0 support, you can combine the storage capacity of the two hard drives and achieve faster read and write speeds. You can install the adapter enclosure into a desktop PC or server. It offers flexible use in hot-swap bays or in a more fixed, permanent installation in a 3.5" hard-drive mounting bay with standard mounting holes. Once installed, you simply slide two 2.5" HDDs/SSDs into the adapter enclosure, with no tools required. The aluminum housing protects installed drives in a durable enclosure. The 35SAT225S3R is backed by a StarTech.com 2-year warranty and free lifetime technical support.